Monsanto Defrauded Investors, Court Rewards Executive? The Securities and Exchange Commission has fined Monsanto $80 million for defrauding investors by misstating its earnings and awarded more than $22 million to the former Monsanto executive who blew the whistle and tipped off the SEC. 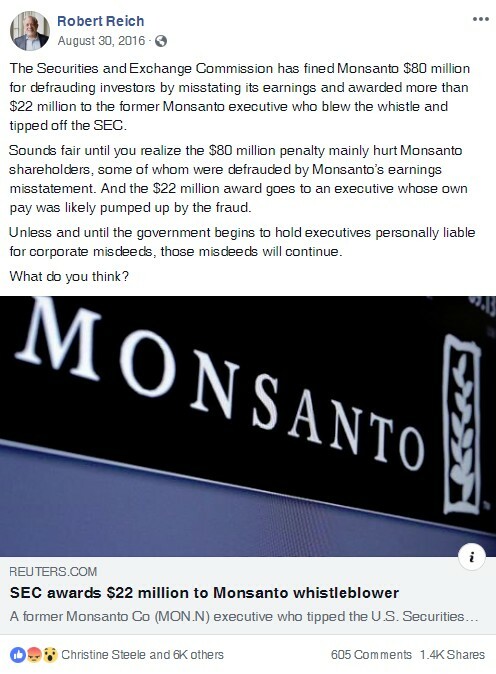 Sounds fair until you realize the $80 million penalty mainly hurt Monsanto shareholders, some of whom were defrauded by Monsanto’s earnings misstatement. And the $22 million award goes to an executive whose own pay was likely pumped up by the fraud. Unless and until the government begins to hold executives personally liable for corporate misdeeds, those misdeeds will continue. This is a drop in the bucket compared to the big problem businesses, like the banks. I don’t see boards being held accountable anytime soon. More likely would be the revising of corporate law to constrain corporate practices in particular ways; say limiting maximum compensation to some multiple of the lowest paid worker, or requiring the corporation to spend x% of gross revenues on charitable works. Next Next post: What the Hell Did That Mean?